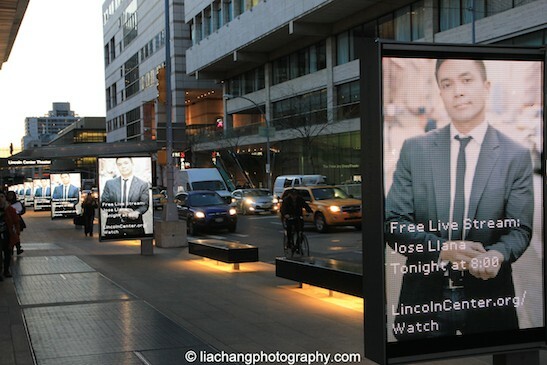 On Thursday night, as I turned the corner of Broadway and W. 65th St. on my way to the Stanley H. Kaplan Penthouse for Jose Llana’s Lincoln Center “American Songbook”, I was greeted by the sight of Llana’s photo by Billy Bustamante, larger than life, on electronic billboards extending the full length of the block, flashing details for the livestream of his concert. Before a sold-out house, Llana’s lush and dynamic tenor filled the elegant, intimate room of The Stanley H. Kaplan Penthouse, framed against the backdrop of stunning views of the New York City skyline. 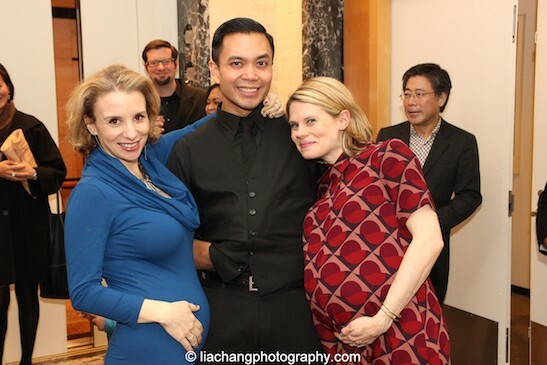 Llana’s recent star turn as Marcos in David Byrne & Fat Boy Slim’s Here Lies Love at The Public Theater (dir. Alex Timbers), was his most charismatic and seductive to date, and garnered him a Lucille Lortel Award nomination for Best Actor in a Musical. 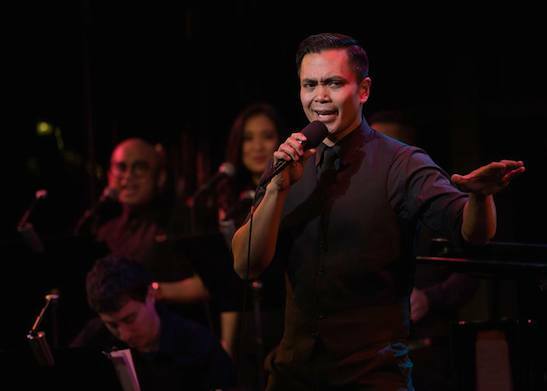 Llana is a gifted storyteller, and his charisma and comedic chops were on full display during his concert celebrating 19 years in the business, having made his professional debut as Lun Tha in the 1996 Broadway revival of Rodgers & Hammerstein The King and I, alongside Donna Murphy and Lou Diamond Phillips. 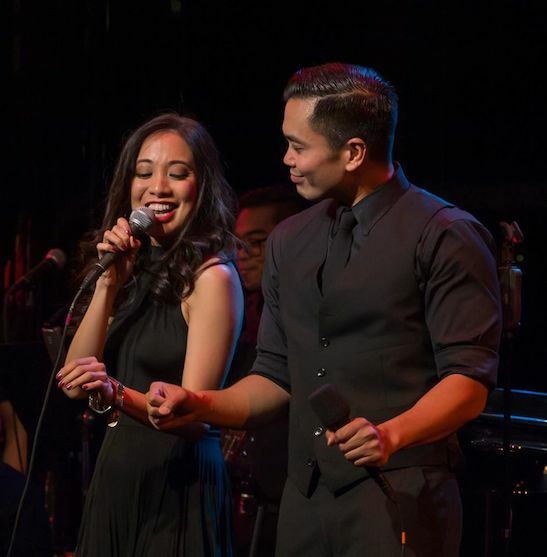 It was a virtual Here Lies Love reunion onstage with musical director Kimberly Grigsby (HLL musical director) at the helm and on the keys; musical arrangements and orchestrations by Matt Stine (HLL musical editor) and Cody Owen Stine; and HLL cast members Jaygee Macapugay, Jeigh Madjus and Enrico Rodriguez as his background singers. He was accompanied by Kevin Garcia on Drums, Pete Donovan on Bass, Simon Kafka on Guitar and Jack Bashkow on Reeds. During the evening, Llana reminisced about his history with The Public Theater, where he appeared as Gabey in the George C. Wolfe helmed On the Town at the Delacorte; in Adam Guettel’s Saturn Returns, directed by Tina Landau; and most recently, as Ferdinand Marcos in David Byrne and Fat Boy Slim’s Here Lies Love. Llana gave shoutouts to Oskar Eustis, David Henry Hwang, Adam Guettel, David Byrne and Alex Timbers, who were sitting at tables in front of me. His selections included songs by Rodgers & Hammerstein, Adam Guettel, Leonard Bernstein, William Finn, David Byrne; in addition to his own spin on tunes made popular by Billy Joel, Maroon 5, Ed Sheeran and George Michael. Llana also sang Kailangan Kita, a Filipino song, featured on Jose, his Filipino-language best-selling album in Manila. Also in the house, Jed Bernstein, Michael Friedman, Jeanine Tesori, Annie-B Parsons, Philip Himberg, Maria-Christina Oliveras, Christine Toy Johnson, Jhett Tolentino, Celia Keenan-Bolger, Sarah Saltzberg, Michael Winther, Debralee Daco, and so many more in the audience who leapt to their feet for several standing ovations. 3. 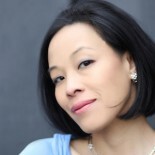 WE KISS IN A SHADOW/I HAVE DREAMED (The King & I by Rodgers & Hammerstein)- Llana’s Broadway Debut in 1996. 8. CHILD OF THE PHILIPPINES — (by David Byrne & Fat Boy Slim)-Llana put his own spin on a song, originally sung by the Aquino character in Here Lies Love, and was joined by Jaygee Macapugay who portrayed Imelda. 11. THINKING OUT LOUD – (by Ed Sheeran)- dedicated to his partner, Erik Rose. 12. LULLABY – (by Billy Joel) – “I have a hero and her name is Patricia. She’s my older sister.” This is the song he hummed to her children, his niece, Veronica and nephew, Max, during midnight duty. 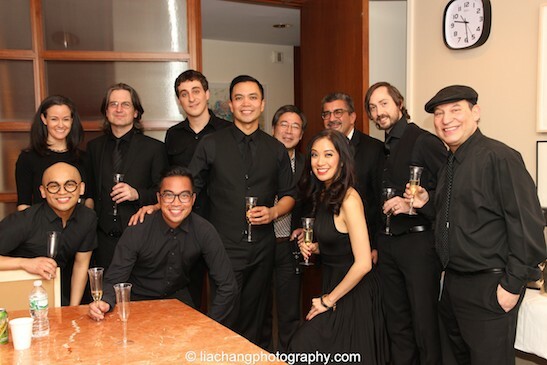 After the concert and champagne toast with his band, Llana greeted his guests in the green room, then headed to his after party at Tavern on the Green with his family. 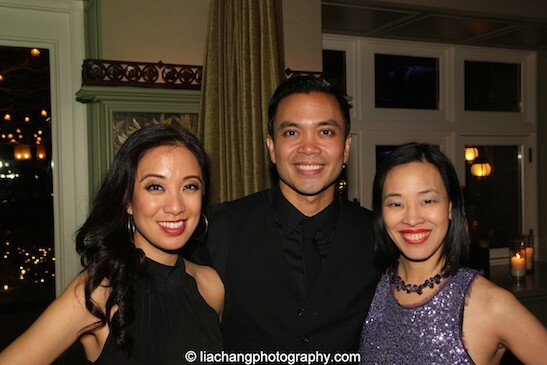 Jaygee Macapugay, Jeigh Madjus, Enrico Rodriguez and Debralee Daco at the Lincoln Center American Songbook afterparty at Tavern on the Green in New York on March 12, 2015. 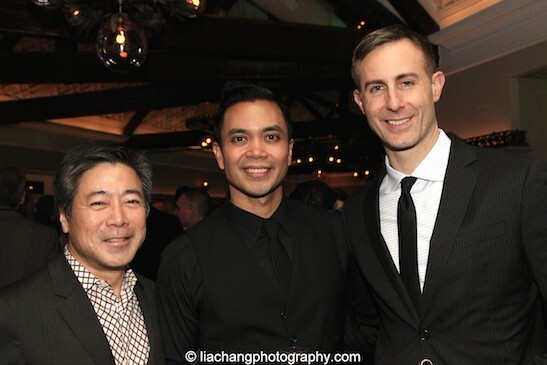 Photo by Lia Chang. Since its launch in 1998, American Songbook has been dedicated to celebrating the extraordinary achievements of the popular American songwriter from the turn of the 20th century to the present day. Spanning all styles and genres from Tin Pan Alley and Broadway to the eclecticism of today’s songwriters working in pop, cabaret, rock, folk and country, American Songbooktraces the history and charts the course of the American song from its past and current forms to its future direction. 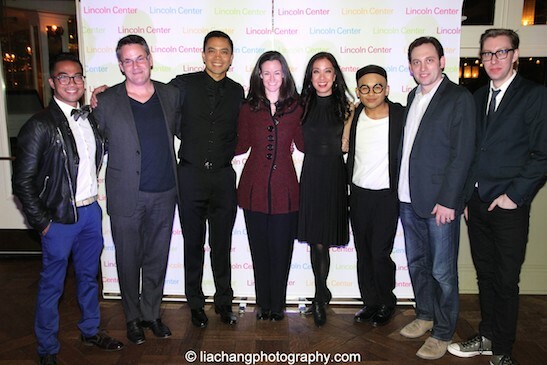 This entry was posted on March 13, 2015 by Lia Chang in Asian American Artists, Entertainment, Events, Music, New York, Performance Photography, Theater and tagged Adam Guettel, Alex Timbers, American Songbook, Annie-B Parson, Apple Store, Backstage Pass with Lia Chang, Conrad Ricamora, David Byrne, David Henry Hwang, Enrico Rodriguez, Fatboy Slim, Ferdinand Marcos, Here Lies Love, Imelda Marcos, J Pardo, Jaygee Macapugay, Jeigh Madjus, Jose Llana, Jose Llana at Lincoln Center, Jose Llana in Lincoln Center American Songbook, Kimberly Grigsby, Lia Chang, Lincoln Center, New York, Stanley H. Kaplan Penthouse, The Public Theater.